The state of California—its ocean swells, its open spaces, its tech-minded culture—has shaped Yves Béhar. The Swiss-born designer first traveled there with his parents in his early teens, at the beginning of the 1980s. The family took a road trip along the coast, making stops at Hearst Castle, Big Sur and Monterey. A few years later, in his early 20s, Béhar returned to study at the Art Center College of Design in Pasadena, from which he graduated with a master’s degree in 1991. He has remained in the Golden State ever since, running his company, Fuseproject, primarily out of San Francisco for the past 18 years. 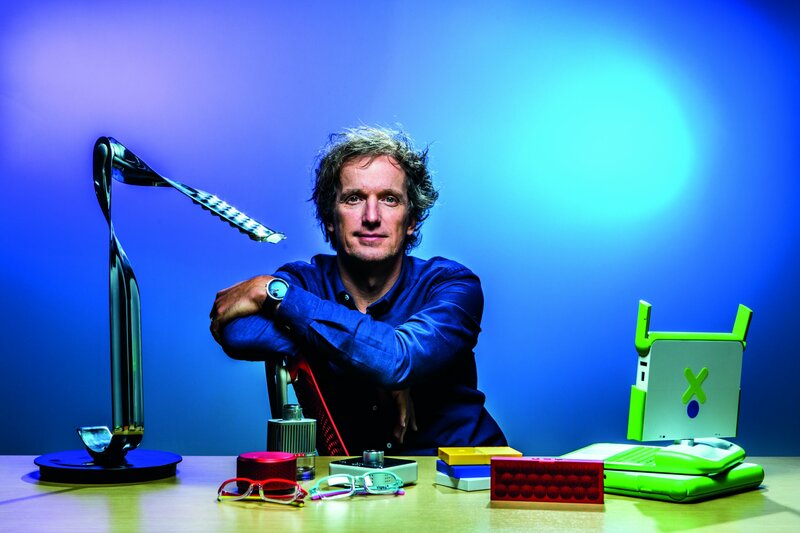 This line of thinking has led Béhar and Fuseproject to create some of the most groundbreaking designs to come out of Silicon Valley in the past two decades—including the One Laptop Per Child XO (2005), a low-cost laptop made for easy delivery to children in developing countries, and the Jawbone Jambox wireless speakers (2011). Béhar has also gained a strong footing in the furniture industry, with a long-running series of collaborations with Herman Miller. Most recently, he has worked with the watchmaker Movado on a line of Swiss-made watches and with Kodak on a revival of its Super 8 home-movie camera. Just a few weeks ago, Fuseproject unveiled its latest innovation, in an exhibition at the Design Museum in London: a prototype for “powered” activity wear that supports movement in elderly people. Growing up in Lausanne, on the edge of Lake Geneva in western Switzerland, Béhar was educated in what he calls a “somewhat conventional” schooling system. In class, his mind often drifted. By his mid-teens, he knew he was not going to follow a traditional path like finance or engineering. It wasn’t until Béhar’s 2015 project with Movado—for which he created the Edge line of watches—that he worked with a Swiss company. “There was a joke among journalists that I was the largest Swiss design studio never to work in Switzerland,” he says. For the Movado collaboration, he found a company that was willing to push boundaries as well as a mass product—a watch featuring the brand’s classic Museum Dial—that was ripe for innovation. Béhar’s solution: to think in 3-D. “Watches are very much still designed from a two-dimensional graphic standpoint,” he says. “I wanted to turn that two-dimensional exercise into a three-dimensional one, to create some depth to the watch, allowing light to travel across it.” The result is a simple dial with a bold, striking and, thanks to Béhar, signature shape that stands out, even though it doesn’t include the brand’s name or logo on its face. Efraim Grinberg, CEO of Movado, says he is thrilled with the outcome. “Yves is able to capture the consumer’s imagination and really make modern design beauti-ful, and that’s not an easy thing to do.” Grinberg also says he intends to continue the Movado collaboration—a potential longevity that speaks to Béhar’s close relationships with clients. In other words, Béhar takes on each project as its own wave. Then, focused and determined, he rides it all the way to shore. Spencer Bailey is the editor-in-chief of Surface magazine and the editorial director of Surface Media.